MG University Degree Admission 2019 Online Registration will be started on May 2019. 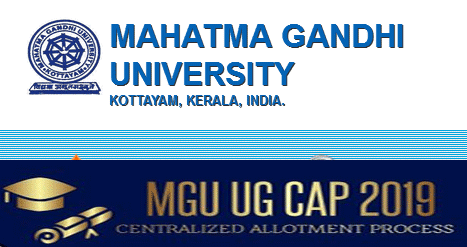 The MG Degree Admission will be under the centralized allotment process UG CAP 2019. The Online Registration for admission to various Under Graduate programmes conducted in the Arts & Science Colleges affiliated to the University shall commence immediately after the publication of plus two results by the Kerala State Higher Secondary Examination Board in May 2019. Applicants to all categories viz. Management, Community Merit, Sports Quota, Cultural Quota, Physically Disabled, Lakshadweep Quotas and Seats reserved for the Malayali students from the Andaman and Nicobar Islands should apply online. The ranklists in respect of Sports Quota, Cultural Quota, Physically Disabled quotas shall be published by the University and admissions shall be conducted by the college authorities from the ranklist on the dates specified in the notification. The admissions to various quotas after the specified dates shall not be permitted under any circumstance.